Isolated residents in a Doncaster town have submitted a 2,000 signature petition as part of a campaign to get a life line rail station reinstated. The group of campaigners, Friends of Askern Railway Station, say the station that was closed due to cuts in the 1940s would help alleviate traffic congestion in the area. The campaigners met with Mayor Ros Jones on Friday to give her the petition. 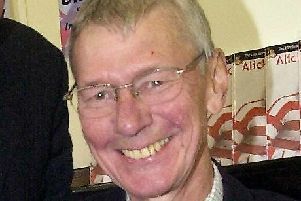 Graham Moss, who founded the group in 2014, said: “The original petition on the internet spawned a lot of debate, with some residents being against it but the majority supporting it. “Askern is the only town in the borough which has a rail line passing through it and no rail station. “Askern did once have a rail station which was lost during the cuts and the group has been formed to get this station put back. The railway station was opened in 1848 and closed in 1948. In September 2008, as part of Doncaster Council’s report on rail corridors, Askern was listed as one of the stations suitable for reopening in the future. Mr Moss said: “A service on this line, primarily between Doncaster and Leeds, would provide a valuable asset to 6,000 local people. “It would help people to not only to get to and from work in Doncaster, Sheffield and Leeds, but also to shop and visit relatives in these places . “The creation of a station would also alleviate a vast amount of traffic entering Doncaster, providing a solution to the age old problem of too much traffic congestion in the borough. “It could also help to ease congestion on the surrounding motorway networks. “Getting our station back would put the town back on the map and I’m certain that would be one of the best things to happen to Askern for many a year. Mayor Ros Jones said: “A request has been made to officers to explore the possibility of a railway station near the airport and at Askern. For more information, search Friends of Askern Railway station on Facebook. n To view the petition, visit www.change.org and search ‘Askern’.